Mr. Snowden has established himself as an international artist of highest acclaim. His engagements have included concerto tours in Europe, the United States and Japan. He has been invited by Lorin Maazel to play with the Pittsburgh Symphony Orchestra and by Seiji Ozawa to play with the Boston Symphony Orchestra. He has performed as soloist with many orchestras including The Royal Philharmonic Orchestra, London Philharmonic Orchestra (including many in the Royal Festival Hall, London), Bournemouth Symphony Orchestra under Andrew Litton, BBC National Orchestra of Wales, Malta Symphony, The London Mozart Players, The Orchestra of St. John’s Smith Square (London) and St. Louis Symphony. He is also in much demand by composers to record their film scores. His recording list includes: The King’s Speech, A Very Harold and Kumar Christmas, James Bond: Quantum Of Solace, Narnia – Voyage of the Dawn Treader, Shrek – Forever After, Defiance, The Dark Knight, The Argentine, Guerrilla, Doomsday, Fool’s Gold, The Great Debaters, Bee Movie, Stardust, 1408, The Da Vinci Code, Over the Hedge, Lord of the Rings, Sense and Sensibility, Pride and Prejudice, Don Juan, Tomb Raider: The Cradle Of Life, Mr. Holland’s Opus, Antz, The Mummy, Bridget Jones Diary, The Mummy Returns, The Four Feathers, Gangs of New York, Gods and Generals, SpongeBob SquarePants and The Mission. Mr. Snowden has regularly broadcasted on BBC Radio 3 and has made numerous television appearances. Jonathan Snowden has recorded with artists as diverse as Bjork, Sting, and Martine McCutcheon. He has done performance spots with Sir Cliff Richard and Elvis Costello. 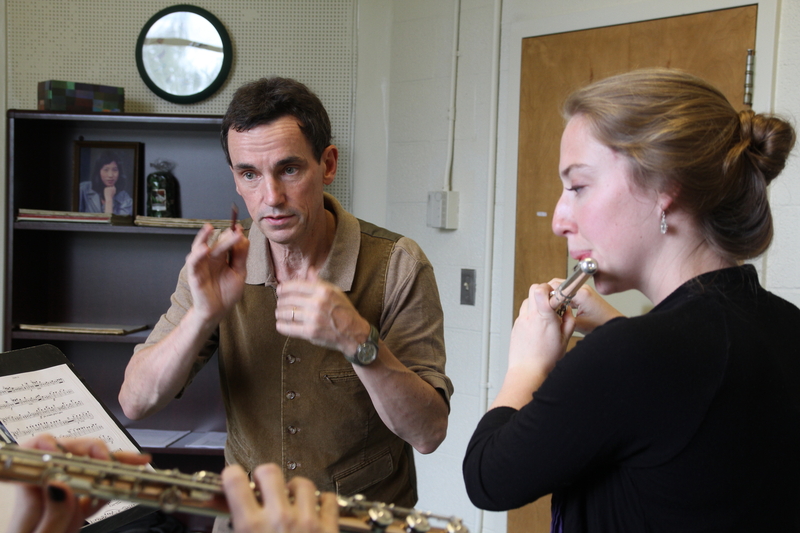 A well-respected pedagogue, Mr. Snowden has been published in Pan (December 2001; May 2003; June 2008), Windplayer (Spring 2003) and Flute Talk (April 1993; February 2007). Powell Flute Company, Brannen-Cooper Brothers and Muramatsu Flute Company have sponsored him as a guest artist for master classes throughout the world. He has held recitals and master classes in Japan, Sweden, Norway, Denmark, Belgium, Ireland, Great Britain (Royal Northern College, Royal Academy of Music, London College and Trinity College) and the United States. Mr. Snowden has appeared regularly by invitation to perform and teach as part of the National Flute Association’s (NFA) annual convention (Atlanta: 1999; Las Vegas: 2003; Pittsburgh: 2006). In support of proposals sent to the NFA, Dr. Brooks de Wetter-Smith, a J.G. Hanes Distinguished Professor at the University of North Carolina at Chapel Hill stated, “His comments were insightful, supportive…everyone seemed to hang on to every word. His playing was wonderful…He brings solid orchestral and solo experience to his teaching.” He appeared, by invitation, at the 2008 British Flute Society’s annual flute convention. Mr. Snowden enjoys teaching and has a unique take on how performers can link emotion and communication to technique and interpretation. He has an extensive knowledge of solo repertoire, as well as the desire to improve anyone’s playing and performance abilities. The notion of taking risks and being a flexible flutist enables a more powerful conversation to exist between the soloist and supporting musicians as well as the music and the audience. He has served on the faculty of the Royal College of Music (London), the London College of Music and on the Diploma Examiner Panel for The Associated board of the Royal Schools of Music (ABRSM). He has also examined regularly for DIT Conservatory of Music (Dublin, Ireland) as well as appearing as a master teacher and guest artist at other Conservatoire’s and courses (Trinity Conservatoire, Royal Academy of Music London and Oxford Summer School). Jonathan conducted his own annual international summer flute course, The Jonathan Snowden International Flutes School in the UK for ten years and now continues to run this in the States. Jonathan is currently Professor of Flute at Shenandoah Conservatory, Shenandoah University, Winchester, Virginia, USA and Artist In Residence at Levine School Of Music, Washington, DC, USA. Jonathan Snowden can be heard on Virgin, Virgin Classics, EMI, Naxos, Silva, Teledisk, Conifer, Decca, Tring, and Hyperion recording labels among others. He has now completed a recording of William Lloyd Webber’s works for flute and is working on additional CDs. He has recorded for “Songs of Praise” (UK television) and Orange mobile phone commercials in the UK.